Moortown Motors of Regent Street, Leeds - VW & Porsche distributors. Homepage. This page: Old papers act as a reminder of Volkswagen & Porsche dealer Moortown Motors Limited, of Leeds. A 1955 VW Beetle purchased at Moortown Motors Ltd.
Moortown Motors Ltd was one of the main agents for Volkswagen cars and buses in the North of England at the time, becoming well-known for their campervan conversions from the late 1950s onwards. A small collection of papers relating to this firm turned up some time back, documenting the purchase and running of two VW Beetles, purchased from this establishment by a Mr M.W. Blackburn, of Margaret Road in Harrogate. The majority of papers refer to a black 1955 VW De Luxe Saloon (type 114), registration UUB 729, purchased used in June 1956. 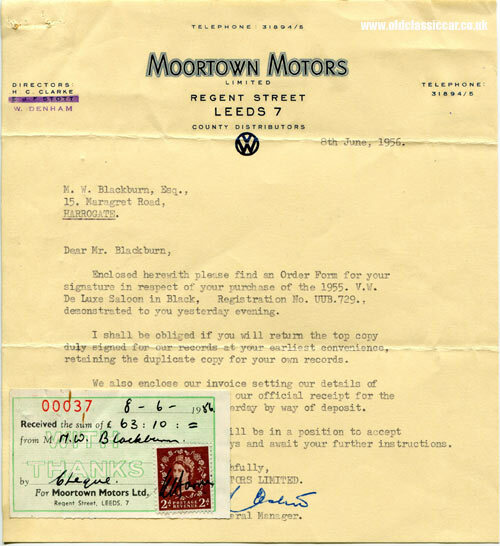 A letter confirming the purchase is shown below. The letterheading lists the firm's two Directors, namely H.C. Clarke, and W. Denham - the latter replacing E.J.F. Stott judging by the amendment stamp at the top left. In 1956 the firm was advertising itself as VW distributors, the Porsche brand would join VW soon after on their paperwork. Mr Blackburn had taken the Beetle for a test drive only the day before. Evidently he was most pleased with the car, and left a deposit of £63 10s 0d on his return to the garage. The invoice, also dated 8th June 1956, advises that the car's purchase price was £635 0s 0d. 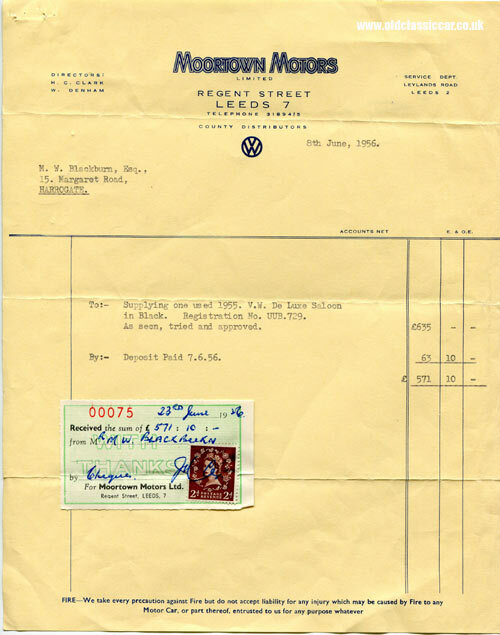 A two-part invoice dating to August 1957, so only just over a year since the car was purchased, describes an involved service that was undertaken on the Beetle at Moortown Motors. This included stripping the front axle, replacing the front torsion bars and both shock absorbers, and overhauling the engine. An anti-roll bar was also fitted to the front of the car at this time, as was a new exhaust. The bill for the work came to £27 2s 5d, so although Beetles were renowned for being dependable and (on the whole) reliable vehicles, extensive servicing work at only two years of age was not uncommon it seems. The company's invoices for 1957 now reflect the change of Directors, and also the adoption of the Porsche franchise (although for some reason the latter only appears on the first page of this two-page invoice). A separate invoice may explain why the VW was treated to such an extensive service. 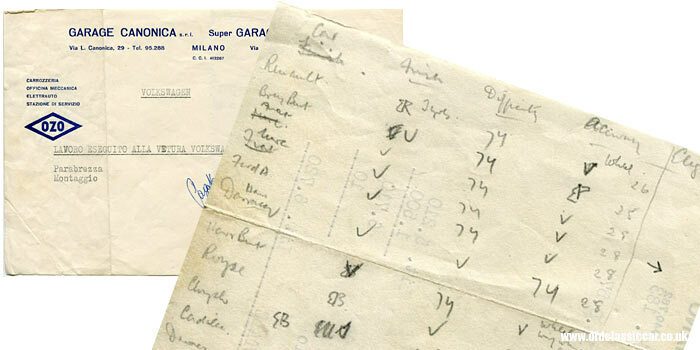 A receipt issued by Garage Canonica of Milan on 14th September 1957, a fortnight after the servicing work in England, suggests that the car was then taken on a trip across Europe. The car needed a new windscreen, which - including fitting - cost 6.720 Lit. Intriguingly, on the reverse of the Italian receipt are pencilled notes from what appears to be a concours event, at which Mr Blackburn was judging - quite possibly during his trip to Italy. Columns titled Car, Finish, Difficulty(? ), Accuracy and Elegance describe the factors under consideration. The list of cars include Renault, Fiat, Ford A, Darracq, Royse (sic), Chrysler, Cadillac, a second Darracq, Buick, Model T, plus a few others I couldn't decipher. What was this concours event I wonder, held in Italy during September/October 1957? Back to Leeds and more repairs. By October the trusty Vee-Dub was back in England, and once again found itself receiving the attentions of Moortown Motors' mechanics. 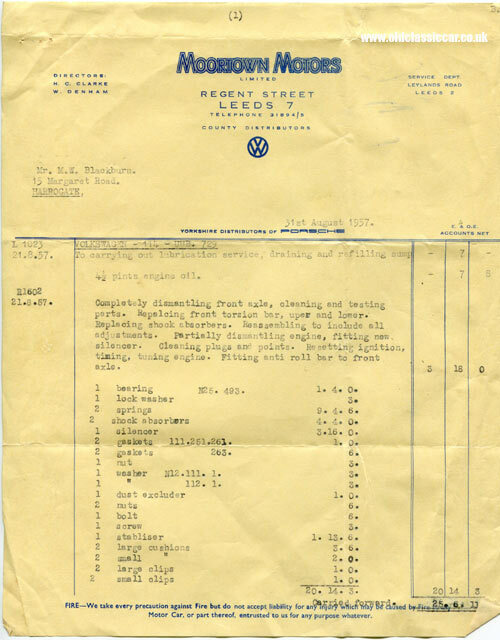 An invoice dated 31st October 1957 describes the engine being partially dismantled, in order that the oil cooler could be replaced. The dynamo was also stripped and repaired. The price for this work was £10 1s 6d. More invoices follow, again referring to servicing work undertaken on the '55 Beetle. In July 1958 the engine was removed for overhaul, as were the rear axle and the transmission. The mileage by this point was 70,374 miles. Other minor items, such as a defective nearside trafficator, were also attended to. 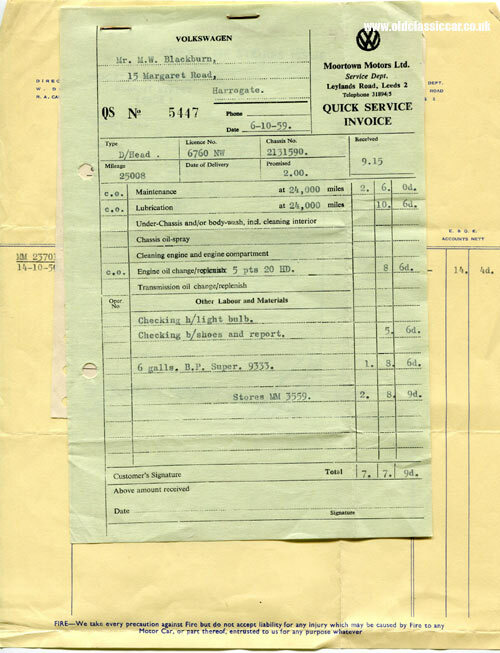 Further invoices from 1958 and 1959 continue to tell the story of this particular VW. Switch from a Type 114 De Luxe saloon, to a Type 152 convertible. Several documents stapled together from October 1959 point to a change of vehicle for Mr Blackburn. No longer is UUB 729 referred to. Now the papers relate to a "D/head" Type 152 (ie the four-seater Karmann convertible) Beetle, registration 6760 NW, displaying 25,008 miles on its odometer. A minor service, at which six gallons of BP Super were added, is described, along with charges for sundry items such as headlamp bulbs, spark plugs and a tin of polish. 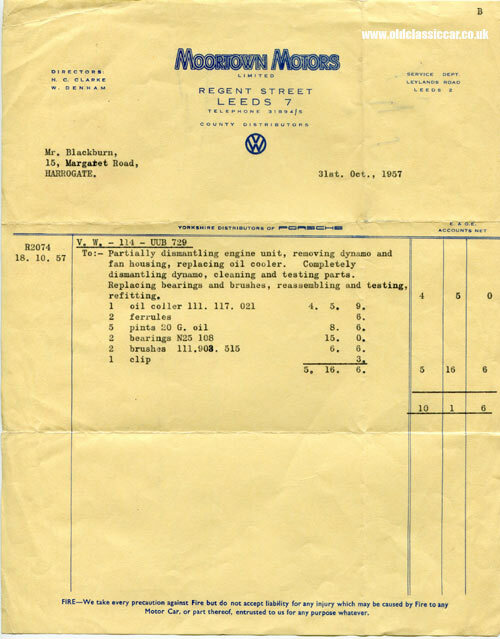 A separate invoice raised in December 1959 now records the mileage raised to 30,463, so Mr Blackburn certainly piled on the miles behind the steering wheel of his faithful VWs. How long this car served Mr Blackburn isn't known, I have no more papers relating to the cars that he owned. Certainly neither car's registration appears on the DVLA database, so presumably they both succumbed to the passage of time, no doubt assisted by the ravages of corrosion. Several period photographs taken in the workshops of Moortown Motors Ltd appear on the 'net. This site for example has snapshots of various VWs being worked upon in their garage, dated 1962. Many old photographs portraying oval-window Beetle saloons similar to the 1955 car driven by Mr Blackburn appear on this site, for example here and here, while this page has a rare photograph of a 1950's VW Cabriolet. Return to the Motoring Collectables section for more early motoring literature.